A Soyuz TMA-05M spacecraft nears the International Space Station ahead of docking to deliver three new residents on July 17, 2012. The Soyuz carried three members of the station's Expedition 32 crew. Three astronauts arrived at the International Space Station early Tuesday (July 17) for a four-month stay, bringing the huge orbiting outpost back to its full complement of six spaceflyers. The Soyuz space capsule carrying the three new crewmembers — NASA astronaut Sunita Williams, Russian cosmonaut Yuri Malenchenko and Japanese spaceflyer Aki Hoshide — docked with the station at 12:51 a.m. EDT Tuesday (0451 GMT) after a two-day flight. 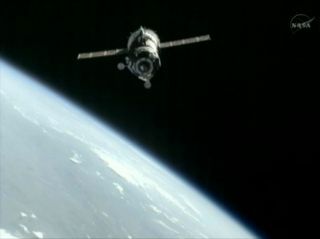 The Soyuz launched into orbit Saturday from Baikonur Cosmodrome in Kazakhstan. "Everything is perfect," Malenchenko radioed Russia's Mission Control Center in Korolev, just outside Moscow. Video cameras on the exterior of the space station captured spectacular views of the Soyuz pulling up to the orbiting lab with the bright blue Earth in the background. At docking time, the Soyuz TMA-05M spacecraft and space station were sailing 251 miles (402 kilometers) over northeastern Kazakhstan. The Soyuz parked itself at an Earth-facing docking port on the station's Russian-built Rassvet module, and the hatches connecting the two spacecraft were opened at 3:23 a.m. EDT (0723 GMT). The Russian-U.S.-Japanese crew aboard the Soyuz arrived at the space station 37 years ago to the day of the world's first truly international space docking: the July 17 meet-up between a NASA Apollo spacecraft and Russian Soyuz 19 capsule during the Apollo-Soyuz Test Project in 1975. During that historic test flight, NASA astronaut Tom Stafford shook hands with Soviet cosmonaut Alexei Leonov to cement the foundation of international space cooperation that ultimately led to the $100 billion International Space Station in orbit today. Today, the space station is the largest human-built structure in space and clearly visible to the unaided eye from the ground to observers who know when and where to look. Fifteen different countries and five space agencies representing the United States, Russia, Europe, Canada and Japan built the huge orbiting laboratory. Construction began in 1998. A Russian Soyuz TMA-05M spacecraft nears the International Space Station with the blue Earth in the background in this view from a station camera during a July 17, 2012 docking of the Expedition 32 crew. After the hatches opened between the Soyuz and station, Williams, Malenchenko and Hoshide floated aboard the station and joined their fellow Expedition 32 crewmembers. That crew includes Expedition 32 commander Gennady Padalka, fellow cosmonaut Sergei Revin and NASA astronaut Joe Acaba. Padalka, Revin and Acaba have had the space station to themselves since July 1, when three spaceflyers returned to Earth and brought the station's previous Expedition 31 to a close. Padalka, Revin and Acaba will come home themselves in mid-September. When that happens, Williams will take over as commander. She, Malenchenko and Hoshide are scheduled to depart the station on Nov. 12. But first, the six-crew Expedition 32 crew will have to prepare for a busy few weeks ahead. On Friday (July 20), an unmanned Japanese cargo ship will launch toward the station carrying a fresh load of supplies for the orbiting lab's crew. It will arrive at the station on July 27. On Sunday (July 22), a Russian robotic cargo ship already at the station will undock as part of a test of rendezvous equipment on the station. It will redock at the station on Monday, NASA officials said. Then, fresh on the heels of the Japanese cargo ship's arrival, another Russian supply ship will launch toward the station on Aug. 1 and dock on the same day to test a new rendezvous plan aimed at cutting down the two-day flight time Russian craft currently endure to reach the station. Two spacewalks are also planned during the Expedition 32 mission. The crew may also be aboard to witness a historic event this autumn: the first official cargo delivery to the station by a private spaceship. In May, the private spaceflight company SpaceX's unmanned Dragon space capsule successfully docked during a test flight, becoming the first commercial spacecraft ever to do so. That flight, however, was a demonstration mission. Dragon's first bona fide cargo mission could blast off this fall, space station officials have said.